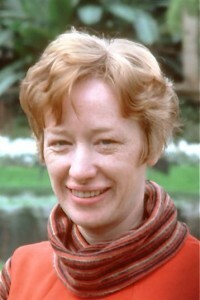 Rachel Grace Smith Matzko, 65, of 17 Professors Place, Greenville, died July 28, 2009 of cancer initially diagnosed in 2002. Born on October 21, 1943 in Rockford, Illinois, she was the daughter of the late Robert Harrison and Esther Robinson Smith. She was a graduate of Bob Jones University (B.A., 1968, B.S., 1970) and earned an M.A. in English from Clemson University in 1979. She taught English composition and literature at Bob Jones Academy and Bob Jones University for more than 35 years. She accepted Jesus Christ as her personal Savior when she was twelve. 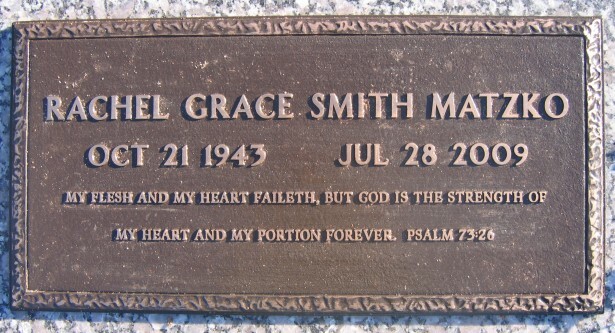 At her death, she was a member of Faith Free Presbyterian Church, Greenville. She easily accommodated to her husband’s interest in history and enjoyed working with him as a seasonal employee of the National Park Service at sites in Virginia, North Dakota, and Nebraska. Modest and unassuming by nature, she was also diligent and persistent. By working her way through college, she became the first member of her family to earn a degree. She met the challenges of her final illness with the same unpretentious resolve with which she served at home and in the classroom. Survivors include her husband, John Matzko of the home, a son, Austin Matzko, and his wife, Melita McMasters Matzko of Nashville, Tennessee; four sisters, Margaret McMillan of Beloit, Wisconsin; Esther Arletta Locascio of Loves Park, Illinois; Althea Wright of Waupaca, Wisconsin, and Lois Smith of Greenville; two brothers Burton Smith of Roscoe, Illinois; and William Smith of Rockford, Illinois; three grandchildren, Samuel, Margaret, and Benjamin Matzko. The funeral service will be at 10: 30 a.m. Saturday at Faith Free Presbyterian Church. Internment will follow in Woodlawn Memorial Park. The family will receive friends Friday from 6 until 8 p.m. at Mackey Mortuary. In lieu of flowers, memorials may be made to the Timothy Scholarship Program of Bob Jones University. Tribute of Pastor Alan Cairns read at the funeral.